To accompany my video lectures, I have created a textbook for basic strategic and extensive form games. You can purchase it here for $4.99 (or ~$12.59 for a hard copy, depending on how much Amazon chooses to charge for it today). 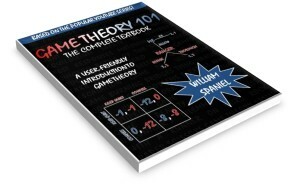 Unlike every other game theory textbook, I designed it as a teaching tool. It has no confusing and extraneous mathematical notation and instead focuses presenting games with full solutions, including the thought process that goes into answering a question.